Nina is almost 3 months old (on thursday). I felt it was time to put down some "landmark moments", so I remember what she was "doing" at such a tiny age. * She now smiles all the time, at anything and everything... a gorgeous hearty smile that brightens up my day. * She is starting to teeth (early it seems), as she constantly bites her hands, is a little cranky and finds relief in a grown-up finger firmly lodged on her gums (I've just bought her an amber necklace, as I hear that can aid the teething process?). * She has grown out of her Newborn clothes and is a little ball of roundness. * Her favourite person is her big brother!!! * She holds her head up quite steadily. * When on her tummy, she is able to hold up her head and shoulders for a few minutes. 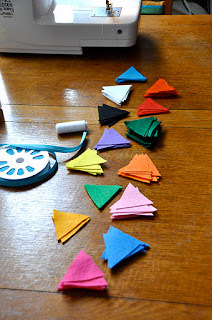 Shamelessly stolen from my friend and fellow crafter Polly (who is an amazingly creative person, always full of fabulous ideas), who recently had a stall at a local Christmas Market here in Hastings, and she used mini bunting to decorate her table. and I attached them all together with some bias binding. 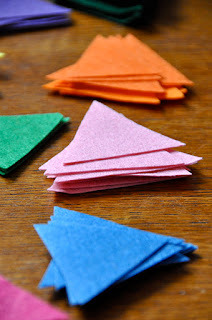 So simple to make and totally effective. Luca will be getting some too!!! 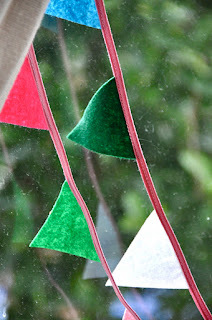 The min felt bunting is fabulous, I have some felt leftovers from christmas makes that would be perfect for this little project. 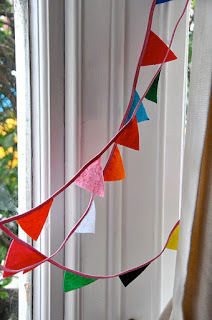 Let me know how the bunting is coming along.